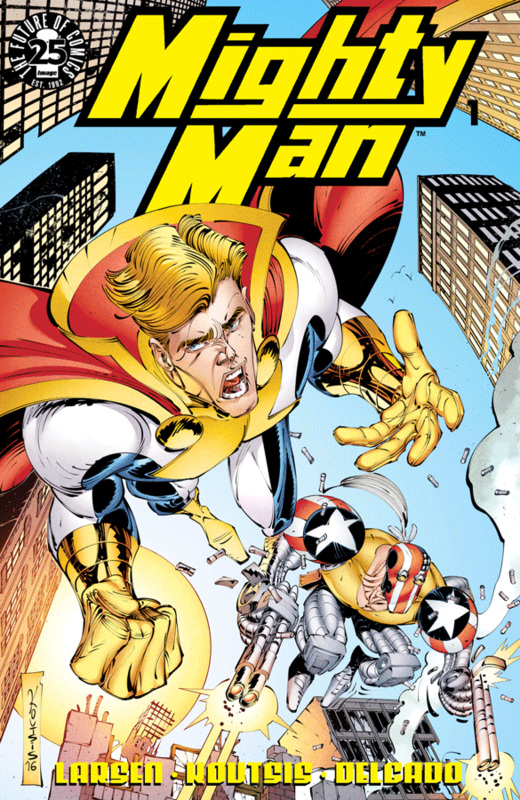 The Fellowship was fortunate enough to obtain a copy of MIGHTY MAN #1 from Image Comics. Erik Larsen writes, Nikos Koutsis draws and colors, and Ferran Delgado letters. The Mighty Man powers have been passed on, but it’s a little different this time. The new Mighty Man is named Betty, and she’s the daughter of the previous bearer. But unlike previous transitions, Betty got her powers in utero. So now she’s an eight-year-old who can transform into a grown man with superpowers. Obviously she needs training, learning to handle her powers as well as the baddies that need her special attention. This is certainly an awkward situation for the team (and Betty, too) to be placed in, but I like how it turns Betty’s training into as much a psychological exercise as a physical one. It’s a great twist on the unprepared superhero story, and I’m looking forward to seeing where it leads. So we’ve got a cool story, and the art does a nice job of showing emotion as well as the usual destruction that comes with this style of book. I also think it’s really cool how the Image folks are bringing back the old standards for their 25th anniversary. It’s a nice blast from the past, and it also gives them a chance to update and upgrade where they see fit. There’s a lot of interesting stuff yet to come from them, I think. MIGHTY MAN #1 is available now from your local comic shop, or online at imagecomics.com.